Triggering factors for landslides could vary from heavy rainfalls/glacial activities to earthquakes, volcanisms or even vibrations due to nuclear explosions or heavy vehicle movement. However, in Sri Lanka landslides are mostly triggered due to heavy and prolonged rainfall. 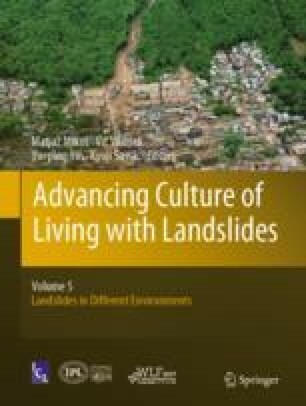 During last few decades, landslides have occurred with increasing frequency and intensity, causing extensive damage to lives and properties. Therefore, it becomes a necessity to predict and warn landslide hazards before it actually takes place which is still a mammoth task to achieve. Although several researches were done based on daily rainfall data in Sri Lanka, it has been identified that the extreme rainfalls with shorter durations could trigger more disastrous landslides. Hence, recommending hourly rainfall thresholds for landslides is much important in terms of hazard warning and preparedness. In this research an hourly rainfall trend was proposed in order to predict occurrences of landslides in Sri Lanka considering hourly rainfall data from twelve hours before to any disastrous event. Special attention was paid to data from Badulla District where more than 200 people were believed to be dead due to one major landslide in November 2014. The developed relationships are compared with Caine (1980) and observed to be matching to a considerable accuracy. Obtaining hourly rainfall data at exact location was almost impossible with the available rainfall measurement procedure in Sri Lanka. Much finer conclusions could have been made with more accurate data. Officials of National Building Research Organization (NBRO) and the Maskeliya Plantations PLC are kindly acknowledged for their cooperation in obtaining data.